With highly qualified services and optimal customer loyalty, AERTiCKET secures its role as Germany's largest full-service consolidator and independent business-to-business service provider in the scheduled flight sector. This means we will remain in future the most important partner - for airlines as well as for travel agencies, cooperations and Internet portals that are involved in scheduled flight sales. We do centralised flight purchasing and sales processing. We develop state-of-the-art booking technology for travel agencies and provide databases. We act as IATA agent for travel agencies and tour operators. We offer our customers friendly and expert service, for example, the complete range of fulfillment services in the travel sector. "From 2018, we see ourselves predominantly as a technology company," said founder, managing director and shareholder Rainer Klee, setting the goal. The airline ticket wholesale business model has been under constant adjustment pressure for years, which has become sensitive since the end of airlines' standard commissions. The Berlin-based company deals creatively with this and develops its own new reservation system - the Cockpit booking world. And reinvents itself. AERTiCKET restructured - and the travel agency cooperation AER together with CEO Rainer Klee takes over 100 percent of the shares, RT Group and STA Travel leave as shareholders. In the course of the new structure, the tour operator Explorer Fernreisen, which has been part of the company since 2008, is switching to the RT Group. 2011 brought something completely new: AERTiCKET became a building developer, too. The "AERTiCKET House" - a whole four-storey rear building - was completely renovated, with the owner's agreement. Bright, modern lofts were created in the traditional Wilhelminian building for the 170 or so AER staff. Modern windows and a cooling system ensure a comfortable indoor climate both in summer and winter, and the photovoltaic system on the roof supplies self-generated electricity. Ethnic Travel has been an important area of business for AERTiCKET for many years, as shown by our investments in the consolidators "The Ticket Team" and "airtuerk". 2008 also brought about an investment in the US wholesale market when the founder and head of Picasso Travel, Huseyin Ozyurtcu, decided on the grounds of age to look for a successor. Sixt pulled out after two years and the longstanding partners AER e.v., STA and Titanic Reisen took over the shares. In the same year, Raiffeisenbank Altötting-Mühldorf (which later became VR meine Raiffeisenbank) became AERTiCKET's principle bank and its chairman became a member of AERTiCKET's supervisory board. This was the beginning of many years of productive cooperation. Online business became increasingly important and AER had big plans. In spite of difficult conditions, investments had to be made and the company Sixt quickly became an innovative partner. 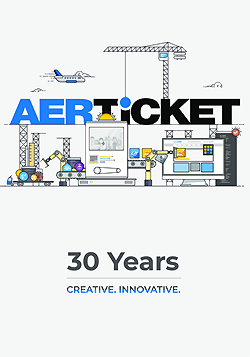 AERTiCKET AG was founded and just ten months later the first combined IATA and consolidator fare database, the "AER-Pilot", was launched on the market. The Amadeus Fare Wizard followed soon after - one of the first booking engines for travel agencies without their own CRS. AER had doubled its turnover in the past three years, now employed 70 members of staff, and in the summer of 2001 relocated its headquarters to new, considerably larger premises in Zossener Straße - naturally still in Kreuzberg. The terrible attacks of September 11 shook the world and the number of flight bookings fell dramatically. AER staff responded to this first, serious crisis in the company's history with solidarity, voluntarily foregoing part of their salary. In 1998, AER took over smaller consolidators in Hamburg, Hanover, Frankfurt and Mainz, followed by subsidiaries in Nuremberg, Munich and Essen in the following four years. This created a network of branches throughout Germany, which ensured proximity and personal contact to travel agencies. AER moved into its first company premises, doubled its turnover within a year and started negotiations with STA Travel about its involvement in the consolidator. Lengthy discussions ensued, because one side insisted on entrepreneurial independence and flexibility, while the other wanted participation in decision making and meticulous planning. An agreement was reached and the successful partnership lasted 20 (!) years. The alternative idea turned into a commercial and personal success: within a few years, Titanic Reisen evolved into an alternative travel agency chain with several branches in the Berlin city area. In 1993, the consolidator AER Reiseservice was founded and Titanic Reisen handed over the consolidation business together with the first three employees to the new company. Under Rainer Klee's management, the course was set for success: after just one year, contracts were signed with around 30 airlines and AER e.V. became the main shareholder of the company. Excellent rates of growth led to ever better contract terms and turnover increased within two years to DM 40 million in 1995. Three years after its foundation, Titanic Reisen started wholesaling airline tickets professionally and became a member of AER e. V. By combining purchasing power it was possible to get cheaper tickets and better contract terms. The principle of mutual support took centre stage - it was seen as a purchasing cooperation. Today's AERTiCKET Group started in 1988, in the city of West Berlin, surrounded by the Wall. The alternative movement in Kreuzberg in the 1980s was creative and innovative. While arranging political trips to Nicaragua, several of the activists had gained so much experience booking flights that they found it easy to open their own travel agency - with the paradoxical name "Titanic Reisen". Autonomy and independence were key. Titanic Reisen had its own IATA number from the very beginning and travel agencies it had befriended in the neighbourhood came to it to order their tickets. The airline ticket business began with this purchasing cooperative. Do you have questions or would you like to become a customer?